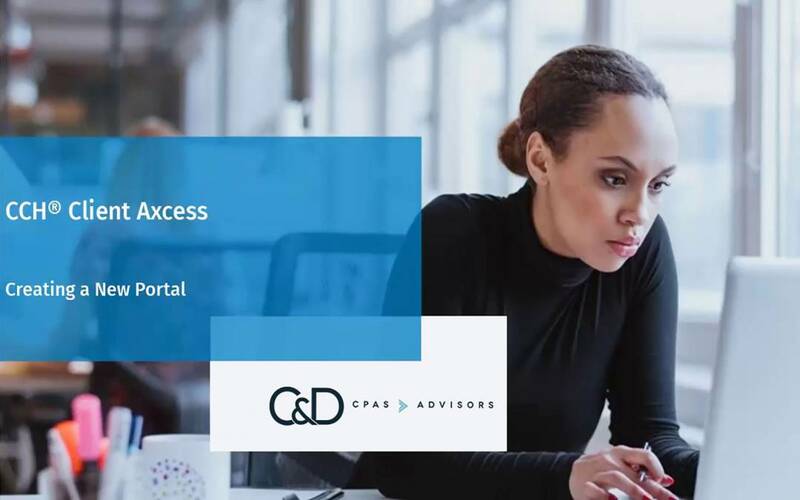 The C&D portal is a secure client portal that provides clients with a single point of access to securely receive and share confirmation tax and financial documents with C&D. Electronic delivery of tax returns! A fresh, easy-to-use interface with no plug-ins required. 24/7 access to view and download your tax returns and other financial documents on your favorite devices, including desktop and notebook PCs or Macs, tablets, and smartphones. A simple drag-and-drop interface for uploading files from a desktop computer. Secure, end-to-end encryption of all files transmitted and stored in your portal. If you do not already have a C&D llp portal set up, and would like to have one set up, or you would like more information on the portal, please contact our Administrative Assistant, Mary Ruiz at mruiz@cdcpa.com or 805-688-5505, extension 105. In order to set up a portal we will need you to provide an email address which we will associate with your portal and will be used as the portal Login ID. We look forward to continuing to provide you with the highest level of client service. We hope you will find the portal to be convenient and easy to use. Is Cryptocurrency Taxable? The Answer Is Yes. What Are the Real Tax Benefits of Being Married? Did You Know There Are Tax Breaks for Buying a Home?